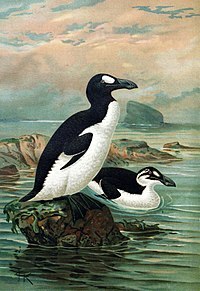 The Great Auk (scientific name : Pinguinus impennis) was a flightless bird of the alcid family that became extinct in the mid-19th century. It was the only modern species in the genus Pinguinus, a group of birds that formerly included one other species of flightless giant auk from the Atlantic Ocean region. It bred on rocky, isolated islands with easy access to the ocean and a plentiful food supply, a rarity in nature that provided only a few breeding sites for the auks. When not breeding, the auks spent their time foraging in the waters of the North Atlantic, ranging as far south as northern Spain and also around the coast of Canada, Greenland, Iceland, the Faroe Islands, Norway, Ireland, and Great Britain. These birds were defenseless, meaning that they could not protect or save themselves, they were hunted for food and bait in the early 1800s by hunters. There was an enormous amount of Great Auks getting killed by hunters, the birds often being driven up a plank and slaughtered on their way into the hold of a vessel. The last known Great Auks were killed in Eldey Island, Iceland. Many of the Great Auk's eggs were said to have been sold to collectors for as much as £300 also. Since then, many auks and eggs were preserved in museums. A close relative of the Great Auk is the Razor Billed Auks. It basically had black backs, white abdomens (belly up to neck), upright posture, small wings, and a big beak. The Great Auk at standing point is about 75 to 85 centimeters (30 to 33 in) tall and weighing around 5 kilograms (11 lb) as adult birds. The bill (beak) was about 10 - 12 centimeters in appearance also. This page was last edited on 30 January 2016, at 04:22.